Early in 2012, the Harbor View Dads undertook the challenge to fund a new technology program utilizing tablets in the classroom to enhance the educational experience for the kids at Harbor View Elementary. Research shows that technology serves to engage and enhance student learning. More about iPad and Education can be found on the Apple Website. Working closely with the school administrators, the technical support staff and the District to plan out all the details, the Harbor View Dads finalized a plan which the District approved as a Pilot program for the 2012-13 school year. The program was rolled out as a one-to-one (each child having access to a device as opposed to sharing devices) in the 6th grade utilizing Apple iPads. With students’ having their own iPads, the learning possibilities are endless — anytime — at school, home, or anywhere. In this program, the classroom teachers will offer students new ways to participate in the learning process. At Harbor View, iPads will serve to enhance instruction and learning, not replace the traditional paper and pencil methods. In the 2013-14 school year, the sixth grade participated in the 1:1 program and grade-level carts were used with other grades. For the 2014-15 school year, the 1:1 program will be expanded to include fourth and fifth grade students. When the program was initiated, it was funded primarily by the Harbor View Dads and by individual “Fund the Need” donations by parents at the PFO’s annual Parents’ Night Out fundraiser. Subsequently, funding has also been received from the school district and the PFO. In fact, the PFO is funding the 1:1 program expansion to 4th and 5th grades. Top performing students can advance at their own pace to higher level materials. Teachers receive more detailed and organized information to structure instruction and time management. Teachers receive advanced diagnostic information for students facing challenges. Example: 2nd grade students having difficulty reading can use applications to determine whether the problem is with eye tracking, etc. Performance information can remain student specific so that when a student advances to the next grade, the new teacher can see specifically where that student finished the prior year and continue the program from that point. The improved data collection makes the handoff from one teacher to the next more efficient and effective. Students get real-time feedback as they are completing lessons so that they learn from mistakes while the material is still fresh. Traditionally, many teachers would go “by gut” when assessing performance and determining remedial action. With the technology, the analytics to make data driven decisions are more available and user-friendly. iPad carts serve as a computer lab on wheels removing the constraint of needing additional classroom space to house computer labs. In the past, only one classroom could use the computer lab at a time. Now, the only constraint is the number of carts which can be financed. Kids think and react differently today than we did when we were in school. They have been using the technology since they were infants. Thus, traditional “analog” teaching methods are passive, give them no control and seem boring to them. The digital experience allows them to control their learning and is “natural” and more interesting to them. 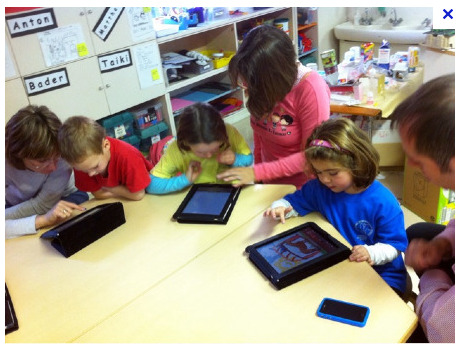 Redefining Instruction with Technology: Five Essential Steps. There is a widespread belief among teachers that digital technology is hampering students’ attention spans and ability to persevere, according to two surveys. I would absolutely agree that technology is changing the way students learn. They are growing up in a different world than we did so naturally they have a different way of learning. The problem is that we aren’t changing the way we teach or what we teach to reflect 21st century skills. It is my experience, both as an educator and as someone who works with educators, that success in education is based on what previous generations valued. The thing is… Our kids have more access to information and people to learn from than any other generation. They are very aware that we are often teaching things without real-world purpose. For example, the English teacher’s observation about depth and analysis of their written work… Are her students writing for an authentic audience? Do they have real purpose in their writing?